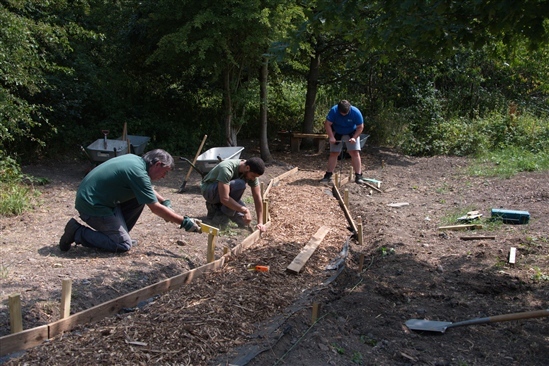 Since last September the hardworking volunteers at RSPB Sandwell Valley have been working on a small patch of land tucked away between Storytelling Corner and one of our Pond Dipping ponds. Following an extremely harsh winter and sky-rocketing temperatures this summer, the reserve has endured three very difficult seasons, But now, as Autumn approaches and promises to blanket us in warm amber and rouge, it seems the earth is much more pliable and the weather much finer for our volunteers to be out working in. Before work started the area was excessively overgrown; brambles tangled with weeds and dishevelled bushes, creating a sort of untamed wilderness which, according to our ecologist, wouldn't provide a safe or quality home for our resident wildlife. So the question was: how could we best transform the area into a place that would be more beneficial for our wildlife? The answer was: a Reflection Garden. The idea for a Reflection Garden, to create a quiet semi-formal/semi-natural area, was formed several years ago and undertaken as a Community Project. Some of the trees in the area were planted in memory of people many years ago, but unfortunately these details were lost in the building fire. Several local groups have helped out during the process: a group of local Duke of Edinburgh students undertook the Volunteering section of their award by clearing the area; HSBC corporate work parties came and worked alongside our own RSPB volunteers; a group from Leonard Cheshire Disability charity designed and helped install some of the stepping stones, and we now have a couple more added to this collection; and a local Women's Institute donated fruit trees for the garden. We have also recently received a donation in memory of a regular birdwatcher which will be used to buy some plants. So far the work party have laid down the foundations for a winding path which will end in a teardrop-shaped path around the wooden bench that hugs a lovely pendunculate oak (otherwise known as an English oak). Last week they began putting in the path from this bench to the reflection pool - which has been dug out and lined in the hopes that newts and dragonflies and other water-loving creatures will make their homes there once it's finished - and back around to the main path. The edging is in ready for the membrane and wood chip to go in soon. After each work party session our volunteers sit down for a well-deserved cuppa and an assortment of biscuits whilst planning out the tasks for the next session. Once the path is completed and the garden filled with luscious green plants, it will be a wonderfully peaceful place to sit, reflect and contemplate. RSPB Sandwell has always been a place of refuge and peace for many, and we hope that this new Reflection Garden will offer an extra special haven for visitors, walkers and lovers of nature alike, surrounded by our local wildlife and a place of natural beauty.